Just what impact climate change will have on hurricanes has been a major area of study in recent decades, with the majority of the focus on what warming might do to the intensity and frequency of such storms. But a new study has revealed an overlooked trend: tropical cyclone activity is shifting away from the tropics and toward the poles. A color-enhanced infrared satellite image of Typhoon Usagi as it moved northwestward toward Hong Kong while explosively intensifying to a Category-5 storm. 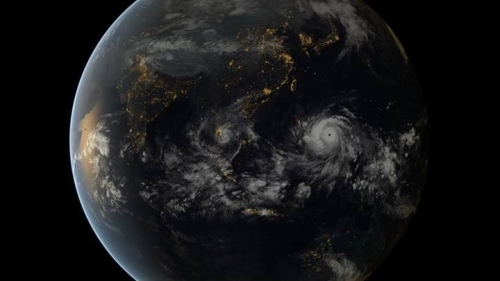 In essence, “the tropics are becoming less hospitable to tropical cyclones and the higher latitudes are becoming less hostile,” said James Kossin, lead author of the study that is detailed in the May 15 issue of the journal Nature. What this means is that the brunt of the damage caused by tropical cyclones (the blanket term for hurricanes and typhoons) could be shifting away from tropical coastal communities and toward those at higher latitudes, though so far, this wouldn’t include the U.S. The study found that the locations where tropical cyclones are reaching their peak is shifting poleward globally, on average, over the past 30 years, although there are differences between individual ocean basins. The shift in strength away from the tropics could be linked to a proposed widening of the tropics themselves. But the result held up to scrutiny, and “it’s one of the more robust” connections for tropical cyclones and global warming, Kossin said. Looking for warming-related trends in tropical cyclone data has always been a thorny issue because of differences in how hurricane records have been kept over time and across different ocean basins. “So when you try to create a global data set of intensity, you get into all sorts of trouble,” Kossin said. But Kossin and his colleagues were looking only at where a hurricane reached its maximum intensity, not what the actual intensity is, which helped alleviate the differences in record-keeping. The biggest signals of the migration of tropical cyclone maximums emerged in the western North Pacific, South Pacific and the South Indian Oceans. However, in the Atlantic Ocean, which is where virtually all of the hurricanes originate that hit the U.S., and in the North Indian Ocean, no poleward trend emerged. Globally, the poleward shift amounts to about one degree of latitude per decade, the study found. That shift falls within the range that has been calculated by various studies for the expansion of the tropics, which has also been potentially linked to the overall warming of the planet as well as depletion of the ozone layer. “The expansion of the tropics appears to be influencing the environmental factors that control tropical cyclone formation and intensification, which is apparently driving their migration toward the poles,” Kossin said in a statement. Two of those environmental factors that are particularly key to fueling hurricanes are wind shear — differences in the speed and direction of the wind at different heights in the atmosphere — and potential intensity, or the theoretical peak that the atmospheric environment will let a storm reach if all other factors are perfect for formation or intensification. The study found that potential intensity was decreasing in the traditional tropics and increasing at higher latitudes, overall, while wind shear was undergoing an opposite shift in each region. That setup would be expected to lead to the shift away from the tropics that Kossin and his colleagues have observed. If tropical cyclones are indeed reaching their strongest point further away from the tropics, that could shift the associated storm risks as well, with coastal communities at higher latitudes bearing more of the brunt. Hurricane researcher Brian McNoldy of the University of Miami, however, cautions that drawing firm conclusions from a relatively short timespan is problematic. Wide-angle satellite image showing Super Typhoon Haiyan approach the Philippines. 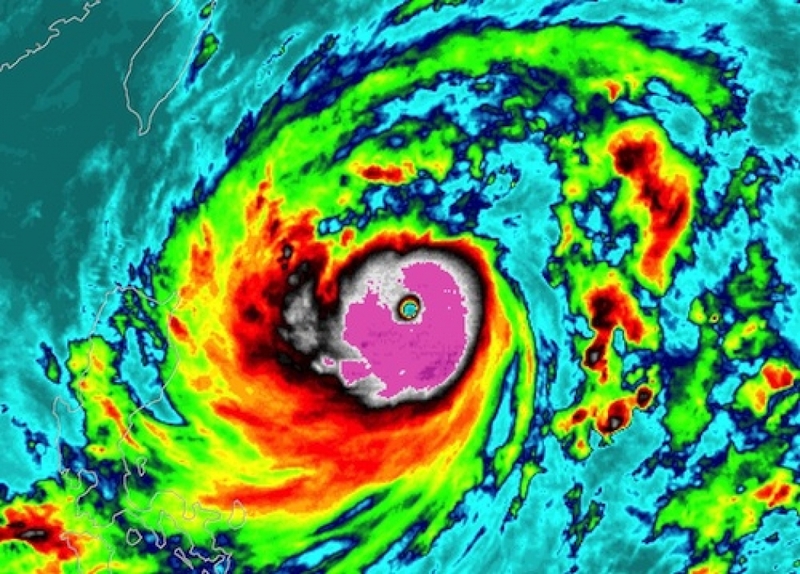 “This is a very slow migration averaged over many storms and all basins, so this would not be noticeable in any particular storm (in other words, if a typhoon hits Japan this summer at its peak intensity rather than Taiwan, that's not validation of this),” McNoldy, who was not involved in the study, told Climate Central in an email. McNoldy did say he thought the overall study was sound, as did Greg Holland of the National Center for Atmospheric Research. “The study provides valuable insight into potential effects of anthropogenic changes on general hurricane activity,” said Holland, who was also not involved in the study. The scientists have a few theories for why some of the world’s ocean basins, particularly the North Indian Ocean and the Atlantic basin, aren’t exhibiting the same global trend. In the North Indian Ocean, any poleward shift is stymied by the fact that land covers the whole area to the north of the basin, leaving storms with nowhere to go. The Atlantic, on the other hand, “has been, as we know, behaving differently than the other basins,” Kossin said. The Atlantic is the only basin with clear trends in the intensity and duration of hurricanes, Kossin said, although what’s behind that trend—whether it’s a natural influence or an anthropogenic one—is uncertain. Whatever it is, though, this trend could simply be overwhelming the one that’s driving tropical cyclones to reach their maximum intensity at higher latitudes. If it is a natural trend operating on the scale of decades, then when it shifts, the poleward shift could emerge. The poleward shift itself could change depending on what is fueling the expansion of the tropics, Kossin said. For example, if ozone depletion is a large factor, then as the ozone hole is plugged, “we may in fact expect this signal to go away,” he said. For now, much work remains to be done to tease out the causes of the trends and to see if climate models can be made to capture them, which they currently aren’t. “We’d also just like to simply dig into it more deeply,” Kossin said. Editor's note: This story has been edited to reflect the eastern North Pacific basin does not show much of the poleward trend, but the South Pacific does.